These Sign Fixtures are Slide-In Poster Frames! These Cheap Sign Supplies For Sale are Easy to Hang! 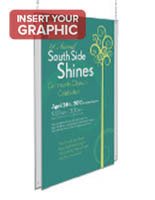 These sign supplies are great for clients that want to publicize in a special way. 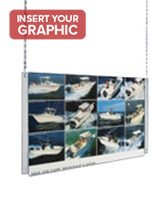 These signage-hanging systems can exhibit artwork or promotions that advertise special functions, sales, bargains plus much more. 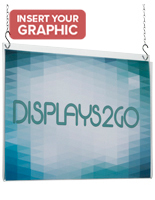 The majority of these inexpensive sign supplies online are observed in commercial shops, eateries and other firms that are routinely changing their media content. 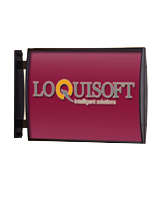 These sign supplies include a 24"w by 36"h non-glare Lucite frame that reduces annoying light reflections for clearer view of signs. These signage-hanging systems come with a hardware kit specially designed to hang these durable frames from the ceiling. 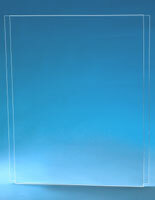 This kit includes two 10' lengths of chain, 4 S-hooks and ceiling snaps (all metal). 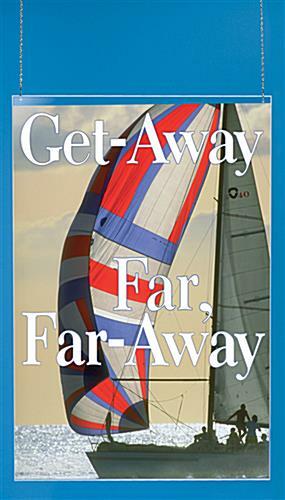 Signs are usually inserted back-to-back for a double-sided display. These sign supplies allow you to attract attention anywhere in a building, as they are not restricted to placement on a wall. 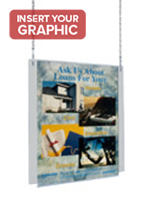 These wholesale sign supplies for sale, signage-hanging systems, are an affordable means to advertise your business.